There are several ways to manage SQL Server vNext CTP1 on Linux. 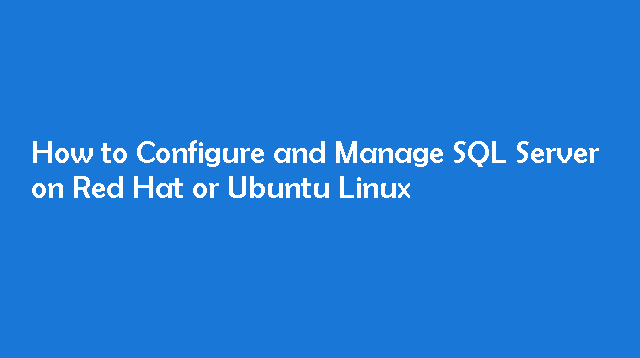 This guide will walk you through the steps to configure and manage SQL Server on Red Hat and Ubuntu Linux. The following section of the article provide a quick overview of different management tools and techniques with pointers to more resources. We have already covered how to install SQL Server on Red Hat and Ubuntu Linux in earlier article. The mssql-conf tool configures SQL Server on Linux. Almost everything you can do in a client tool can also be accomplished with Transact-SQL statements. SQL Server provides Dynamic Management Views (DMVs) that query the status and configuration of SQL Server. There are also Transact-SQL commands for database management tasks. You can run these commands in any client tool that supports connecting to SQL Server and running Transact-SQL queries. Examples include sqlcmd, Visual Studio Code, and SQL Server Management Studio. SQL Server Management Studio (SSMS) is a Windows application that provides a graphical user interface for managing SQL Server. Although it currently runs only on Windows, you can use it to remotely connect to your Linux SQL Server instances. For more information on using SSMS to manage SQL Server, see Use SSMS to Manage SQL Server on Linux. PowerShell provides a rich command-line environment to manage SQL Server on Linux. For more information, see Use PowerShell to Manage SQL Server on Linux. TCP port: Change the port where SQL Server will listen for connections. Default data directory: Change the directory where the new SQL Server database data files (.mdf). Default log directory: Changes the directory where the new SQL Server database log (.ldf) files are created. Default dump directory: Change the directory where SQL Server will deposit the memory dumps and other troubleshooting files by default. Default backup directory: Change the directory where SQL Server will send the backup files by default. Set traceflags: Set the traceflags that the service is going to use. Set collation: Set a new collation for SQL Server on Linux. The following sections show examples of how to use mssql-conf for each of these scenarios. This command also assumes that a /tmp/log directory exists, and that it is under the user and group "mssql". This option will let you change the default location where the memory and SQL dumps are generated whenever there is a crash. By default, these files are generated in /var/opt/mssql/log. This option will let you change the default location where the backup files are generaqted. By default, these files are generated in /var/opt/mssql/data. The mssql-conf utility will try to restore the databases using the specified collation and restart the service. If there are any errors, it will roll-back the collation to the previous value. This topic introduces SQL Server Management Studio (SSMS) and walks you through a couple of common tasks. SSMS is a Windows application, so use SSMS when you have a Windows machine that can connect to a remote SQL Server instance on Linux. SQL Server Management Studio (SSMS) is part of a suite of SQL tools that Microsoft offers free of charge for your development and management needs. SSMS is an integrated environment to access, configure, manage, administer, and develop all components of SQL Server running on-premises or in the cloud, on Linux, Windows or Docker on macOS and Azure SQL Database and Azure SQL Data Warehouse. SSMS combines a broad group of graphical tools with a number of rich script editors to provide access to SQL Server to developers and administrators of all skill levels. When working with SQL Server, you should always use the most recent version of SQL Server Management Studio (SSMS). The latest version of SSMS is continually updated and optimized and currently works with SQL Server vNext on Linux. To download and install the latest version, see Download SQL Server Management Studio. To stay up-to-date, the latest version of SSMS prompts you when there is a new version available to download. While connected to the master database, you can create databases on the server and modify or drop existing databases. The following steps describe how to accomplish several common database management tasks through Management Studio. To perform these tasks, make sure you are connected to the master database with the server-level principal login that you created when you set up SQL Server vNext CTP1 on Linux. In Object Explorer, right-click on the Databases folder, and then click *New Database..."
The new database is successfully created in your server. In Object Explorer, expand the Databases folder to see a list of all the database on the server. The database is successfully dropped from your server. The Activity Monitor tool is built-in into SQL Server Management Studio (SSMS) and displays information about SQL Server processes and how these processes affect the current instance of SQL Server. When a pane is expanded, Activity Monitor queries the instance for information. When a pane is collapsed, all querying activity stops for that pane. You can expand one or more panes at the same time to view different kinds of activity on the instance. This topic introduces SQL Server PowerShell and walks you through a couple of examples on how to use it with SQL Server vNext CTP1 on Linux. PowerShell support for SQL Server is currently available on Windows, so you can use it when you have a Windows machine that can connect to a remote SQL Server instance on Linux. SQL PowerShell on Windows is included with SQL Server Management Studio (SSMS). When working with SQL Server, you should always use the most recent version of SSMS and SQL PowerShell. The latest version of SSMS is continually updated and optimized and currently works with SQL Server vNext CTP1 on Linux. To download and install the latest version, see Download SQL Server Management Studio. To stay up-to-date, the latest version of SSMS prompts you when there is a new version available to download. Let's start by launching PowerShell on Windows. Open a command prompt on your Windows computer and copy and paste the commands below to launch powershell. Let's use PowerShell on Windows to connect to your SQL Server vNext instance on Linux and display a couple of server properties. Remember to replace with the IP address or the hostname of your SQL Server vNext CTP1 instance on Linux. Let's use PowerShell on Windows to examine error logs connect on your SQL Server vNext instance on Linux. We will also use the Out-GridView cmdlet to show information from the error logs in a grid view display. In the above steps, we have covered how to configure and manage SQL Server on Red Hat and Ubuntu Linux.